Winfrey earned $165 million last year according to Forbes. 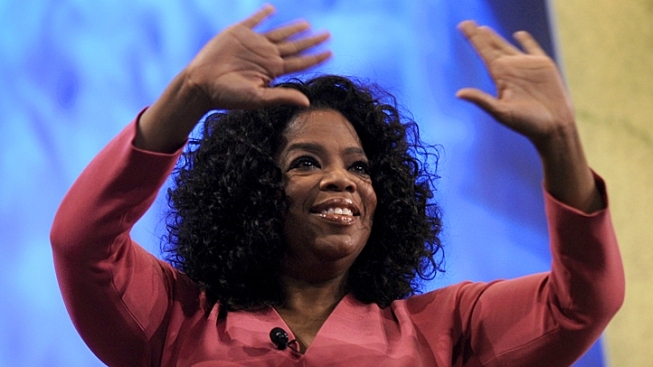 Oprah tops Forbes' list of highest paid celebrities for the fourth year in a row. Oprah Winfrey lands on top of Forbes' highest-paid celebrity list for the fourth year in a row, thanks to an income estimated at $165 million. Though her talk show has wrapped and OWN (her cable network) still continues to struggle in the ratings war, Winfrey's Harpo productions, her magazine, O, and her satellite radio station all contributed to keeping her at the top. But only just. Coming in a close second is director Michael Bay, whose earnings between May 2011 and May 2012 are estimated to be $160 million. That number is mainly thanks to his film, "Transformers: Dark of the Moon," which was a critical flop but a box office behemoth raking in over $1 billion in ticket sales globally. Hollywood royalty Steven Spielberg lands at number three with $130 million. Fourth place is producer Jerry Bruckheimer ($115 million) and in a surprise appearance, Dr. Dre clinches fifth place with $110 million. Forbes notes that Dre did not earn that money from recordings but from sales of his Beats by Dr. Dre headphones. Handset manufacturer HTC paid $300 million last August for a 51% stake in the headphone brand which Dre co-founded with Intersope chief Jimmy Iovine in 2006. Rounding out the top 10 highest paid celebrities are Tyler Perry ($105 million), Howard Stern ($95 million), author James Patterson ($94 million), George Lucas ($90 million) and Simon Cowell ($90 million). In creating the list, Forbes takes into account upfront pay, profit participation, residuals, endorsements and advertising work. Agent fees and expenses are not deducted.